C. B. Hewitt & Bros.
C. B. Hewitt & Bros. were paper manufacturers and wholesalers, and they arrived late at 23-25 Greene St. The company began in 1870 at 48 Beekman St., where they were located until around 1918/19. was included in the New York Times's list of "Business Firms ... among the best and most reliable in the City of New-York" (2 May 1853, p. 6). C. B. Hewitt became C. B. Hewitt & Brother in 1872, then C. B. Hewitt & Bros. in 1884. The first brother to join Charles B. Hewitt was Edward G. Hewitt (1836-? ), an older brother, and the second brother was George Frederick Hewitt (1849-1922), a younger brother. These three constituted the makeup of C. B. Hewitt & Bros. until 1901. This advertisement comes from Trow's New York City Directory of 1878 when there was only one brother. This one comes from the Commercial Register in Trow's New York City Directory of 1882 when there still was only one brother. This one comes from Lain's Brooklyn Directory of 1891 when there were two brothers. Charles B. Hewitt died in Cannes, France, while on a trip to Europe. The New York Times (15 Dec. 1901, p. 13) account reads, "Charles Bloomfield Hewitt, head of the New York paper firm of C. B. Hewitt & Brothers, nephew of ex-Mayor Abram S. Hewitt and brother-in-law of Edward M. Shepard, died yesterday in Cannes, France. With him at the time of his death were his wife and two of his three daughters... Mr. Hewitt was born in Bloomfield, N. J., fifty-seven years ago, and was the son of Francis Hewitt, eldest brother of ex-Mayor Hewitt. He was educated at Cooper Institute and was a Twenty-third Regiment veteran. He married Miss Shepard, sister of Edward M. Shepard, and became engaged in the paper business. His home at 182 Congress Street, Brooklyn, was the scene of Mr. Shepard's daily receptions to reporters during the recent municipal campaign." The following description of Hewitt appeared in the Hardware Dealers' Magazine, Volume 24, 1905, "C. B. Hewitt & Bros., 48 Beekman street, New York, are manufacturers of Building, Roofing and Insulating Papers. One of their sample cards contains samples of 'Venetia' rosin sized Sheathing, 'Venetia' Insulating Paper for cold storage refrigerating purposes, 'Cottage' rosin sized Sheathing, U. S. Fiber Plaster Board which is used instead of plaster. Neponset Red Rope Roofing Fabric, Neponset Black Building Paper, Neponset three-ply Insulating Paper, 'Old Hick' Red Rope Paper for insulating and sheathing purposes; Florian fireproof deadening felt to be used between double floors; No-Noise Felt, 'Red Hawk' Red Rope Roofing Paper, 'Black Hawk' Waterproof Sheathing, etc. The concern also make a specialty of Hardware wrapper papers. They have a large trade on all grades of woodworking glues." An advertisement for Hewitt is found in the Google Book version of Hardware Dealer's Magazine, 1905. C. B. Hewitt received this entry in Sweet's Indexed Catalogue of Building Construction, 1906. Clearly many of their paper products were intended for use in building construction. This later advertisement for Hewitt dates from 1916 when they were still located at 48 Beekman Street. This one from the same year appeared in The Clothing Designer and Manufacturer and advertised Hewitt paper for clothing designers. Edward G. Hewitt died some time between 1910 and 1920, and the youngest brother, George F. Hewitt, died in 1922. His son, George Frederick Hewitt, Jr. (1888-? ), assumed control at that time, but his tenure seems to have lasted only a short while. By 1930 when C. B. Hewitt moved to Greene St., leadership had passed out of the family. The New York Times (21 Jan. 1930, p. 48) reported, "C. B. Hewitt & Bros., Inc., Robert A. Alberts, president, has bought the five-story building at 23-25 Greene Street, between Canal and Grand Streets, from the 23 Greene Street Company, Inc. The structure is to be used for a warehouse and offices by the Newitt [sic] company now at 16-24 Ferry Street. The firm, organized 62 years ago, makes and imports glue and gelatine." The C. B. Hewitt & Bros. entry in Sweet�s Architectural Catalogue, 1917, reading, C. B. Hewitt & Bros. / Building, Roofing and Insulating Papers / 48 Beekman Street / New York, N. Y. advertised Building, Insulating and Roofing Papers for building purposes as follows: �Venetia� Red-Rosin Sized Sheathing and Insulating Paper, �Oakland� Sheathing and Insulating Paper, U. S. Fibre Plaster Board, �Old Hick� Fibrous Red-Rope Paper, �Black Hawk� Red-Rope Waterproof Roofing Paper, and �No Noise� Deadening Felt. 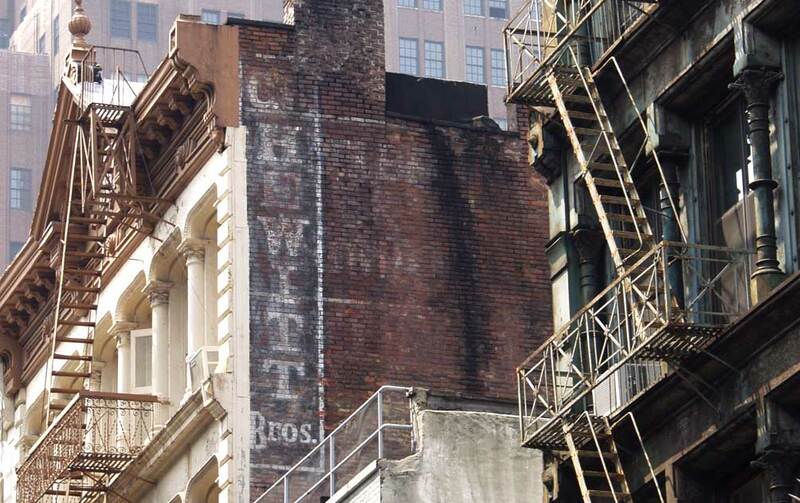 This advertisement for Hewitt dates from 1920 when they were located at 16-24 Ferry Street. Another Hewitt ad from 1922 shows this same address. Like the entries in the Sweet's catalogs, the emphasis is on paper products for building construction. Hewitt stayed at 23-25 Greene St. until 1966/67. At that time they became a division of George W. Millar & Co.